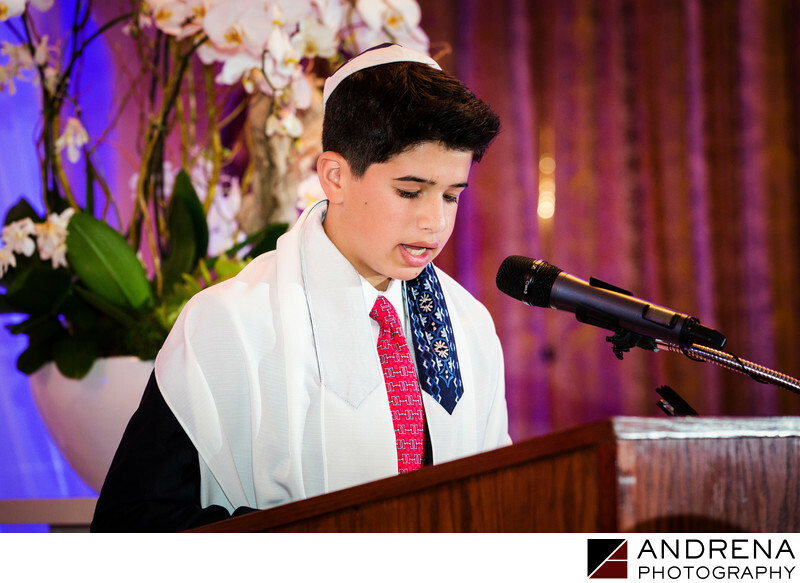 Throughout our many years in photography in Los Angeles, we've had the great fortune of working with some of the warmest and kindest families as they celebrate Bar and Bat Mitzvahs. This boy always brought a winning smile and positive attitude to posing for his solo and family portraits, and he read and spoke beautifully during his ceremony. It is our goal to always make sure kids feel at ease and even have fun in front of the camera. We also prioritize documenting the ceremony from every angle, so that clients can choose from various poignant photographs like this one when it comes time to design an album. The flowers on the stage helped give this photo an air of elegance.